Research on solid polymer particulates is becoming more prevalent, especially with regard for the public’s concern regarding the fate and effects of microplastics in the environment. Microplastics are generally characterised as water-insoluble, solid polymer particles that are ≤ 5 mm in size. Microplastics are often detected in the environment but the risks they pose are debated and largely unknown. Regulatory efforts to examine microplastic safety have been raised as future areas of concern and focus. For example, EU COM has given ECHA a mandate to prepare an Annex XV restriction dossier on microplastics. The mandate contains a broad definition that will likely include the following elements: synthetic, water-insoluble and non-biodegradable polymers used in plastic microbeads of 5mm or less, and at least 14 polymers. ECHA has 12-months to prepare a restriction dossier and an additional 18-24 months to review and approve. Assessing the applicability and adaptability of the existing hazard assessment framework to solid polymer particles can provide insight into the relative hazard of these particles and will help to identify future targeted testing efforts to support read-across and categorical assessment of solid polymer particles. Assessing the applicability and adaptability of existing toxicity testing methods and framework to solid polymer materials (i.e., microplastics). Recently, Connors et al. (2017) conducted a review of the quality and focus of environmental research in the microplastics area. In this paper, nine areas requiring improvement in microplastic research are delineated (g., a need for a thorough characterization of the test particles, analytical verification of test concentrations, environmental relevance of tested materials, inclusion of appropriate controls, and endpoint applicability for environmental risk assessment, etc.). Selecting and designing appropriate hazard studies with environmentally relevant exposure levels and pathways. Determining the physical, chemical, and environmental factors responsible for any observed adverse effects in test organisms. Determining the potential relevance and sensitivities of traditional test species and dosing methods. Connors KA, Dyer SD, Belanger SE. 2017. Advancing the quality of environmental microplastic research. Environmental Toxicology and Chemistry 36:1697 – 1703. Phase 1: It is proposed that a comprehensive literature review be conducted in order to identify both key ecological hazard research gaps and the appropriate methodologies for conducting hazard tests with microplastic materials to fill these research gaps. This literature review should focus on the applicability, adaptability, and usage of existing toxicity testing methods for evaluating the hazards of solid polymer materials for representative test organisms (i.e., fish, invertebrates, algae) and organisms which have been identified as potentially sensitive to solid polymer particles. It is expected that published literature, expert input from stakeholder workshops, and relevant summary reports and guidance from regulatory groups and various task forces are consulted during the comprehensive literature search. Some key review papers, reports, and presentations on microplastics are recommended in the annex to this RfP. Phase 2: Based on this comprehensive literature review, targeted ecological hazard research should be proposed and, if approved by the Cefic LRI/ECETOC Monitoring Team, conducted to evaluate how both intrinsic and extrinsic factors influence the effects of microplastics on sensitive environmental species. Identifying key factors that determine the toxicity of microplastics. Considerations for the physical and chemical composition of microplastics include (but are not limited to): size, shape, charge, and type of microplastic. Potential derivation of threshold values (e.g. based on particle number or total plastic concentration [mg/L]) which characterise hazard of certain classes of microplastics. Determining which exposure scenarios and receptor species are most relevant and important to consider in environmental hazard and risk assessment of microplastics. 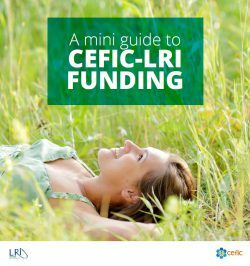 Download here the full version of the RfP LRI-C49.